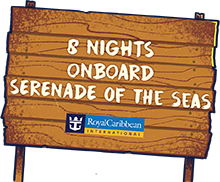 The Serenade of the Seas leaves from Sydney on 5th of October, 2020 and sails to the Pacific Islands with stop overs in Lifou, Isle of Pines & Noumea (New Caledonia). All beautiful tropical destinations with fabulous Shore Excursions & Tours available. It then sails back to Sydney on 13th October, 2020 arriving into port at dawn for disembarkation. Yes, when we stop off in all Ports of Call you will get the chance to take part in the Shore Excursions & Tours or even just get off the Ship and explore for yourself at your own pace. Once you board the Serenade you will get a list of the different types of day trips available for the upcoming Port – if there is a specific trip you would like to do, it is recommended you book it as soon as possible at the Shore Excursions Desk. The tour prices vary, based on duration & type. You will receive your key card at check in which is the only form of payment on board, no cash is exchanged. This key card is the key to your room and identification on board, so it is recommended you take it with you everywhere you go on the ship. Although all meals and performances are paid for (excluding specialty dining options), if you would like to purchase duty-free souvenir, shore excursion’s or alcoholic beverages etc., you will need to use your seapass card. All CRUISIN COUNTRY 2020 artist performances, on board experiences and entertainment is included in your ticket price. NOTE* Some extra Serenade shipboard activities such as bingo and fitness classes incur a minimal charge. Refer to your cruise compass daily in-room newsletter for further information whilst onboard. - Port charges and government taxes. Short answer: No, not all of them. The Serenade of the Seas has now added some new speciality restaurant options. Premium dining options such as Giovanni's Table, IZUMI, Chef's Table, Samba Grille & Chops Grille all incur a dining surcharge. Contact your Cruiseco agent for more information. Theme Nights: There will be three theme nights - 1. Island & Nautical 2. Willie & Dolly and 3. Sports Teams. They are not compulsory but are highly recommended, our passengers love getting involved! There are many different types of shops on the Serenade of the Seas, boutique stores that sell the best of the best brand names along with clothing and souvenirs, all at Duty Free prices! The Serenade of the Seas is a modern ship fitted with stabilizers that will make the biggest wave seem like a tiny little movement. We are also travelling at the smoothest time of year, in an area of ocean that is known for smooth sailing. If by any chance you do feel unwell once you get on board, complimentary sea sickness ginger tablets can be obtained from the Purser’s Desk, or you can visit the medical staff on board.